Guilia Ciuoli is a Tuscan textile designer and handweaver who creates bold new designs and fabrics for interiors and fashion. Her studio is called Pamphile, a reference to Greek mythology. Pamphile was the daughter of Platea, and it is said that she invented silk weaving on the island of Kos. Giulia works in the traditional manner with a hand loom, making textiles recognisable for its structure, striking colours and patterns. 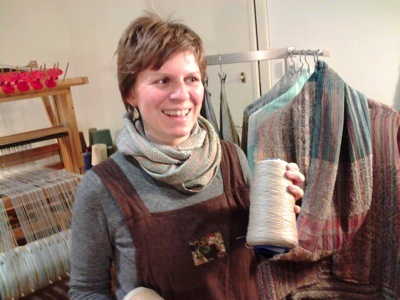 Giulia is an expert in all the different fibres available in Italy and creates works with threads such as nettle and hemp as well as the more usual wools and silks. She explained that silk is an intelligent fibre, able to cool the body in heat and warm it in the cold. Amongst Giulia’s designs is the innovative ‘Loretta’, a giacca-scialle. This combines the sleeves of a jacket with the style of a shawl. Many of her designs can be worn in several different ways and they are all made from a luxurious combination of threads. I had no idea how time-consuming weaving is. 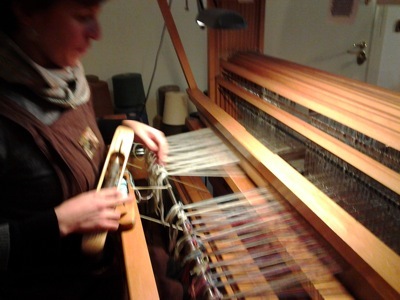 Setting up the different threads on the loom, as above is a very complicated procedure and takes 14 hours. FOURTEEN HOURS! Then the actual weaving of a jacket takes 5 to 6 hours, although given the width of the loom she is able to make two at once in that time. This is true artisanal weaving, undertaken for the love of the craft. At the business end of the loom Giulia demonstrated the art of the shuttle, pulling the correct frame towards her after every pass of the thread so that the material started to form in front of her. The movement of the frames contributes to the texture of the textile being created and is a complex procedure. Much of it is controlled with the feet and indeed the whole process, when seen at full-flow is like watching someone playing a large organ. Except at the end you get a new jacket. 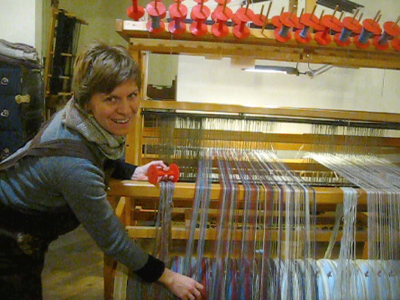 Giulia also produces many other forms of textiles for fashion and interiors. You can see her collection online here. Or follow her on Facebook and Twitter. I find this article so amazing! I have so much respect for Guilia Ciuoli. Being a consumer science student, one of my subjects is Textiles, and it just so happened that we were taught about the different looms and weaving, and I honestly could not imagine why someone would participate in hand-weaving. However seeing Guilia’s creations, is ever so inspiring, she creates something so personal, intricate and beautiful. Definitely time-consuming but so worth it! remarkable! very inspired and motivated… with hard work, time and dedication the most beautiful things can definitely be created.